As the only person to have signed the three most significant founding documents of the United States—the Declaration of Independence (1776), the Treaty of Paris (1783), and the U.S. Constitution (1787)—Benjamin Franklin holds a revered place in the history of U.S. law. Through his great success as a newspaper publisher, journalist, writer, civic leader, scientist, politician, and diplomat, and as an inventor, Franklin became an international celebrity in his day and an icon of the American character to later generations. Franklin's varied career had a lasting effect on U.S. law and politics. As a leading local figure, he established and shaped many of the fundamental institutions of Philadelphia and colonial Pennsylvania. Before the Revolutionary War (1775–83), Franklin served as envoy to Great Britain for several colonies. Though he first advocated reconciliation with Britain, he eventually supported the cause of American independence. He was assigned the task of securing an alliance with France during the war, and his political skill and prestige helped gain vital support for his young country as it fought the world's greatest military power. After the war, Franklin used his diplomatic ingenuity to negotiate a successful peace treaty with Britain. Franklin also helped persuade the Constitutional Convention of 1787 to reach important compromises on the particulars of the Constitution, and his support of that document greatly improved its chances of ratification. Franklin was born January 17, 1706, in Boston, into a devout Puritan household. His only formal education consisted of two years of grammar school, after which he began work for his father, who was a tallow chandler, or candle maker. At age twelve, he was apprenticed to his half-brother, James Franklin, a printer and the founder of the New England Courant, the fourth newspaper established in the British colonies. In his teenage years, Franklin began to improve himself by reading on his own, including the works of such authors as John Bunyan, Plutarch, Daniel Defoe, Cotton Mather, Joseph Addison, and John Locke. Franklin employed his literary talents early, and wrote for the Courant articles satirizing Boston life and politics. He became a manager of the newspaper, but then abruptly moved to Philadelphia in 1723 after disagreements with his brother. Franklin arrived in Philadelphia at age seventeen with only one Dutch dollar and a copper shilling in his pocket. He found work in a print shop and prospered enough to start his own printing business in 1728. In 1730, Franklin became sole owner of the Pennsylvania Gazette, which he transformed from a failing enterprise into a very influential newspaper. He also had success in other publishing ventures, including Poor Richard's Almanack (1732–57), an annual that presented practical information, satire, proverbs, and aphorisms. In 1730, Franklin married Deborah Read, with whom he had two children. He also had two illegitimate children, one of whom, William Franklin, later became governor of New Jersey. In 1727, still a rising young businessman, Franklin formed a club of tradesmen called the Junto, which met each week for discussion. This group became highly influential in the life of Philadelphia and Pennsylvania. Under his leadership, it founded a circulating library, the first of its kind in the colonies, in Philadelphia in 1731; the American Philosophical Society in 1743; a city hospital in 1751; and an academy that developed into the University of Pennsylvania. Franklin led the group in making many other civic improvements as well. 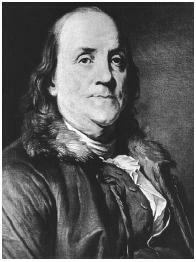 In 1748, now wealthy from his printing and publishing interests, Franklin retired from business. He devoted the rest of his life to natural philosophy, writing, politics, and diplomacy. In the area of natural philosophy, or science, Franklin's ingenuity and curiosity gained him world renown as both an inventor and a theoretician. He designed an improved stove, later dubbed the Franklin stove, that was widely used, as well as bifocal glasses and a new type of clock. He began to study electricity in 1746. His ideas and experiments on this subject—including the famous experiment that involved a kite with a metal key attached to it—identified the electrical nature of lightning. His work with electricity gained him many honorary degrees, including membership in the Royal Society in 1756 and in the French Academy of Sciences in 1772. He also developed a theory of heat absorption and was among the first to describe the Gulf Stream ocean current. Franklin's study of natural philosophy was interrupted by an involvement in politics and diplomacy that ultimately dominated the last part of his life. In Pennsylvania, he was a member of the Quaker party, which sought to democratize the colony's politics and wrest power from its original founders, the Penn family. He served as a representative to the Pennsylvania Assembly from 1751 to 1764. In 1754, he represented Pennsylvania at the Albany Congress, which had been called to unite the colonies in a war against the French and Indians. There, he unsuccessfully presented the Plan of Union, which would have established partial self-government for the colonies. The British did not approve of Franklin's plan because they felt it gave too much power to the colonies, and the colonial assemblies rejected it because they felt it gave the British monarch too much power. Franklin also shared with another person the office of deputy postmaster for the colonies, from 1753 to 1774. In this office, he did a great deal to increase the frequency and efficiency of mail delivery. Franklin began a long and successful diplomatic career when he went to England in 1757 as the agent of the Pennsylvania Assembly. He remained in Britain through 1762 and met many leading figures of British society, including the philosopher David Hume and the author Dr. Samuel Johnson. After spending two more years in Pennsylvania, he returned to England in 1764 to serve again as the Pennsylvania Assembly's agent, and remained in Britain as an agent for various colonies in turn, until 1775. During his years abroad, he witnessed firsthand the growing rift between Britain and the colonies. In the controversy over the 1765 Stamp Act, Franklin emerged as the American colonies' chief spokesperson and defender. The act imposed a tax on publications and papers and provoked an outrage in the colonies. As the first of a series of major disputes between the colonies and Britain, the Stamp Act catalyzed the American colonies' desire for independence and united them in opposition to Britain. Franklin opposed the Stamp Act before Britain's House of Commons. His articulate answers before Parliament were published widely and earned him much admiration in America and abroad. Franklin also opposed such controversial acts of Parliament as the Townshend Acts (1767) and the Tea Act (1773). Although he originally worked for reconciliation with Britain, Franklin left for America in March 1775 convinced of the need for American independence. Immediately upon his return to Philadelphia, Franklin was chosen to be a member of the Second Continental Congress. He again sketched a plan of union for the colonies. He also was one of a committee of five, including John Adams and Thomas Jefferson, appointed in 1776 to draft the Declaration of Independence, the document that formally announced the colonies' break from Britain. Franklin signed the document, thereby becoming a revolutionary at age seventy. Soon after, the Continental Congress sent Franklin and two others to negotiate a critical treaty with France. Before he left, the wealthy Franklin also loaned the struggling Congress several thousand pounds. Franklin was greeted as a hero in France, where translations of his scientific and literary works had gained him much admiration. He was treated by all classes of society as a great oracle, and his image was reproduced widely in prints, medallions, jewelry, and snuffboxes. "His reputation in Europe," Adams commented, "was more universal than that of Leibnitz or Newton, Frederick or Voltaire, and his character more beloved and esteemed than any or all of them." During the first years of the Revolutionary War, Franklin worked in France to secure war supplies and build credibility with the French, who were reluctant at first to cast their lot with an untested new country. France and the United States finally signed an alliance in 1778, after which Franklin became the first U.S. minister to France. Fulfilling the myriad duties of that office with great diplomatic skill, he continued to gain crucial supplies and money for the U.S. cause. In 1781, after defeat at the Battle of Yorktown had persuaded the British to give up the war, Franklin participated in delicate peace talks with Britain. He had much to do with the favorable terms of peace set forth in the Treaty of Paris, which finally gave the United States complete independence from Britain. If a property representation takes place, the small states contend that their liberties will be in danger. If an equality of votes is to be put in its place, the large states say their money will be in danger. When a broad table is to be made, and the edges of the planks do not fit, the artist takes a little from both, and makes a good joint. Later, Franklin urged other members of the convention to approve the final version of the Constitution. "I consent, Sir, to this Constitution," he declared to the convention, "because I expect no better, and because I am not sure that it is not the best. The Opinions I have had of its Errors, I sacrifice to the Public Good." In the following battle for ratification of the Constitution, Franklin used his considerable reputation to promote its success. For the last few years of his life, Franklin retired to Philadelphia. In his last public act, he signed a memorial to Congress for the Abolition of Slavery. He died in Philadelphia on April 17, 1790, at the age of eighty-four. Among his many lasting literary works is his autobiography. Brands, H.W. 2000. The First American: The Life and Times of Benjamin Franklin. New York: Doubleday. Franklin, Benjamin. 1993. Benjamin Franklin: Autobiography and Other Writings. Edited by Ormond Seavey. New York: Oxford Univ. Press. Franklin, Benjamin. 1993. The Autobiography of Benjamin Franklin. Edited by Louis P. Masur. New York: St. Martin's Press. Isaacson, Walter. 2003. Benjamin Franklin: An American Life. New York: Simon & Schuster.Lemay, J.A. Leo. 1993. Reappraising Benjamin Franklin. Univ. of Delaware Press. Murrey, Christopher J., ed. 2002. Benjamin Franklin: Biographical Overview and Bibliography. New York: Nova Science.